Mark Helm is a trial lawyer and appellate advocate with special experience in disputes involving investment firms or their portfolio companies; media and intellectual property matters; and claims against law firms. Mr. 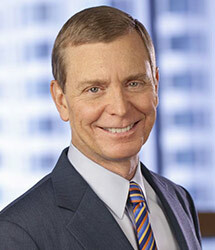 Helm is listed as one of The Best Lawyers in America with a specialty in media law. Mr. Helm has significant experience in trade secrets and employee mobility cases in numerous industries, including asset management, aircraft leasing, and technology of various kinds, and has lectured extensively on the subject. He has a wide range of experience litigating corporate law disputes involving the duties of directors, officers, or shareholders. He also has conducted internal investigations in a variety of substantive and organizational settings. Mr. Helm has extensive experience as an appellate advocate, having argued more than 25 appeals in state and federal courts throughout the country, and is frequently retained at the post-trial-motion stage after unsuccessful trials. As a recent example, he successfully argued the Ninth Circuit’s 2014 affirmance of a district court ruling that a citizens suit could not be brought under the Resource Conservation Recovery Act to challenge diesel particulate emissions at railyards. From 2005 to 2010, Mr. Helm served as co-managing partner of Munger Tolles and was named in 2008 as one of Lawdragon’s “100 Managing Partners You Need to Know.” He served from 2009 to 2012 as co­-chair of the ABA Litigation Section’s Committee on Pro Bono and Public Interest. Mr. Helm is a vice chair of the board of directors of the YMCA of Metropolitan Los Angeles, a member of the board of directors of the Ojai Playwrights Conference, and a member of the Pacific Council on International Policy. Before joining Munger Tolles, Mr. Helm clerked for Chief Justice Warren E. Burger of the U.S. Supreme Court (19831984) and Judge Carl McGowan of the United States Court of Appeals for the District of Columbia Circuit (1982-1983). Before attending law school, Mr. Helm served for a year as the political speechwriter for Mayor Kevin H. White of Boston.